Pope Francis will address Congress tomorrow. What he will say is anybody’s guess. The current Bishop of Rome is known for off the cuff comments and, if not rewriting Catholic doctrine, at least shifting the Church’s tone in a way that is unpredictable, challenging and, Lord forgive the sacrilege, entertaining. Plenty of people have commented on Rep. Gosar’s willful ignorance of the scientific consensus regarding the planet’s warming, as well as his abandonment of the critical thinking he purports to have learned at a Jesuit university. Less covered but no less obvious, however, is the peculiarity of someone essentially reviewing a speech that has yet to be made. Perhaps this is the least unusual element of Rep. Gosar’s protest. In reality, this kind of pre-emptive critique is symptomatic of the ever-increasing immediacy that characterizes so much of our news and our lives. We have become so swift at observing, disseminating, judging and moving on to the next incident that we have taken to getting started before the initial event even occurs. We have expedited the process of how we talk about the world around us at the expense of truly knowing what we are talking about. A relatively superficial example is a guest blogger’s column in the Los Angeles Times shortly after CBS announced Stephen Colbert would replace David Letterman as host of the Late Show. The author claimed the blowhard alter ego Colbert played on The Colbert Report would be a more suitable choice than the real Stephen Colbert. “See? He’s already softening,” he lamented after quoting Colbert’s heartfelt expression of gratitude to CBS and Letterman. The problem, of course, was that this analysis was offered well over a year before Colbert would take over. I wonder how the writer felt waiting nearly 18 months to determine if he disliked the show as much as he publicly predicted he would. I understand a myriad of mundane and bizarre qualities make the modern world go round. One of these is a 24-hour news/information cycle that relies on people talking quite literally all the time, sometimes with incomplete or inaccurate details. The result is that we end up not only discussing topics while the jury is still out; we also render judgments before they return to the courtroom. I hope Rep. Gosar reconsiders his decision, if only because so many would love to have the opportunity to see and hear Pope Francis. I hope he attends and is, per the pope’s apparent modus operandi, surprised. After all, what fun would politics, punditry, the papacy and life in general be if we always knew what was coming next? “[God's] will for us was the 24 hours of each day: the people, the places, the circumstances he set before us in that time. Those were the things God knew were important to him and to us at that moment, and those were the things upon which he wanted us to act, not out of any abstract principle or out of any subjective desire to ‘do the will of God.’ No, these things, the 24 hours of this day, were his will; we had to learn to recognize his will in the reality of the situation. Cada escuela necesita una heroína. Entre los que están trabajando en Fe y Alegría 44 en Andahuaylillas, Perú está Hermana Rosario Valeavellano. Una nativa de Lima que ha vivido y trabajado en los Andes para 40 años, Hermana Rosario, 71, es una monja en la Sociedad del Sagrado Corazón de Jesús, una socia en el equipo administrativo del colegio y, de toda su vida, una protector de los pobres y marginados a quienes Fe y Alegría ayuda. Fe y Alegría es un movimiento educativo popular fundado en Venezuela en 1955. En Perú hay 79 instituciones que sirve más como 80.000 niños. Sin embargo Fe y Alegría es más como un grupo de escuelas. Profesores no sólo trabajan a educar a jóvenes sino también a influir la manera en que jóvenes ven y viven en el mundo. Andahuaylillas (pronunciado On-da-wai-li-us) tiene niveles iniciales, primarias y secundarias de Fe y Alegría y ha estado el hogar al movimiento para 19 años. Trabajando con los administradores, coordinadores académicos y profesores, Hermana Rosario es una abogada incansable para los 880 estudiantes de Fe y Alegría en Andahuaylillas. Ella viaja a Lima con frecuencia a reunir con otras administradoras y a otras partes del mundo a recaudar dinero para la escuela. Aunque ella no enseña en el salón, ella utiliza la hora cívica cada lunes para hablar con los estudiantes como grupo. También utiliza horas libres para hablar con los alumnos como individuos. Ella hace todo voluntariamente, sin ganar pago para sus esfuerzos a cambiar a la sociedad y vidas. Every school needs a hero. Amongst those working at Fe y Alegría 44 in Andahuaylillas, Peru is Hermana Rosario Valdeavellano. A Lima native who has lived and worked in the Andes for 40 years, Hermana Rosario, 71, is a nun in the Society of the Sacred Heart of Jesus, a member of the school’s management team and a lifelong defender of the poor and marginalized Fe y Alegría seeks to support. Fe y Alegría is a popular education movement established in Venezuela in 1955. In Peru alone, there are 79 institutions that serve more than 80,000 children. But Fe y Alegría is more than a simple collection of schools. Teachers work not only to educate young people but also to impact the way they see and live in the world. Andahuaylillas (pronounced On-duh-why-lee-us) has initial, primary and secondary-level Fe y Alegría institutions and has been home to the movement for 19 years. Working alongside principals, academic coordinators and teachers, Hermana Rosario is a tireless advocate for the roughly 880 students Fe y Alegría educates in the small Andean town. She often travels to Lima to meet with other administrators and to other parts of the world to fundraise on the school’s behalf. Though she does not teach students in the classroom, she takes advantage of Monday morning assemblies to address them as a group and free periods to get to know them as individuals. She also does all of this voluntarily, receiving no salary for her countless efforts to change society and lives. Hermana Rosario con alumnas de Fe y Alegría y voluntaria jesuita Theresa Cutter. 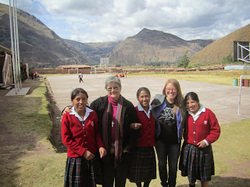 Hermana Rosario with Fe y Alegría students and Jesuit Volunteer Theresa Cutter. To read about my travels in Peru, please visit www.brianharperu.wordpress.com. Thank you!